Welcome to St. James Hospital! We are glad you are visiting our new website to learn about our services, programs, and providers and our new affiliation with the University of Rochester Medical Center (UR Medicine). In early 2018, St. James Hospital became the sixth to join UR Medicine's network of inpatient hospitals, including Strong Memorial and Highland in Rochester, Jones Memorial in Wellsville, Noyes Memorial in Dansville, and F. F. Thompson in Canandaigua. Since 2015, St. James has partnered with UR Medicine under an administrative services agreement that has brought new health services to Hornell, including primary care and many specialty services. 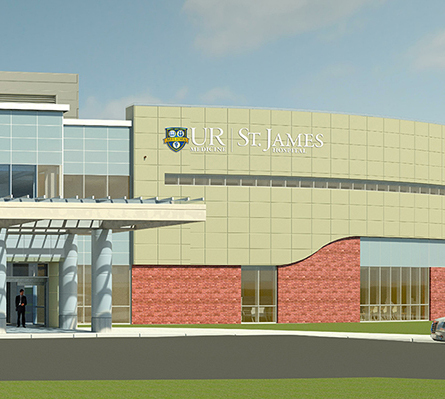 The affiliation will help St. James to continue expanding services throughout the region and improving patient care, and to complete construction of the new Hospital in 2020. We look forward to continuing to bring and deliver top-quality healthcare to residents in the Hornell area. Ambulatory surgery is time saving for you, your family, and business responsibilities. It costs less than inpatient hospitalization. We provide a full range of services from consultations to minimally invasive surgery to total joint replacement. Urgent Care is the perfect choice when your doctor’s office is closed and you need care right now. Adjacent to the new Medical Office Building (opening December 2018) is a brand new St. James Hospital building, slated to open in early 2020. The Hospital will house our emergency department, observation unit, 15 inpatient beds, infusion clinic, surgery, pharmacy, imaging services, lab, registration, human resources, gift shop and cafeteria. This new, modern space will be fully equipped with state-of-the-art technology and equipment, as well as a new electronic medical record system. ​​​​​​​All gifts to the Foundation are tax-deductible. To optimize and appropriately account for your gift, we recommend that you consult with your tax advisor or attorney.